We wish to extend our sincere thanks and appreciation for your support of the Black Womens Mobilization for the Care of Life and Ancestral Territories. Your contributions ensured that their historic gathering will take place--starting TODAY! Thanks to you we reached nearly 80% of our target! We have closed the fundraising campaign and we have sent the funds to Colombia to facilitate the gathering. Please visit www.blackwomensmarch.org and www.mujeresnegrascaminan.com for the latest updates about the gathering and the Black Womens Mobilization. UPDATE: We've made it 1/3 of the way to our $10,000 goal! The organizers of the Black Women's Gathering in Colombia sent a message of thanks to all of you who've donated! Please share on facebook to keep spreading the word and to help us get to two thirds of our goal! Through this weekend of presentations, workshops, inter-generational exchanges, cross-cultural dialogue, art, conversation and skill shares, over 160 Black women from across Colombia, Honduras, the U.S. and Brazil will create a collective agenda from, by and for Black Women for the collective care of life and ancestral territories with a local and Afro-diasporic focus. Help us raise $10,000 USD to make this important gathering a reality! Any amount helps! $20 covers lodging for one participant for the length of the gathering. 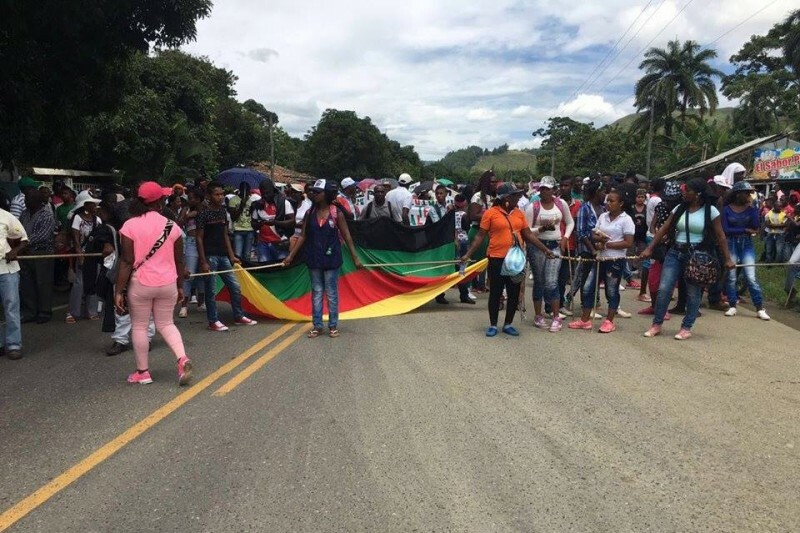 On November 17th, 2014, dozens of Black women from southwest Colombia mobilized a 400 mile march from Cauca to Bogotá, called the ‘Black Women’s Mobilization for the Care of Life and the Ancestral Territories’ to demand the respect of their territorial rights. When the Colombian Government refused to negotiate in good faith the Black Women’s Mobilization for the Care of Life and Ancestral Territories occupied the Ministry of Interior to demand the removal of armed illegal mining activities that continue to steal the intergenerational source of accessible gold deposits, poisoning rivers, and threatening their lives and long-term displacement of their families from their rural ancestral lands. Since then, their leadership and vision have played a central role in their communities’ efforts to demand--and win--an Ethnic Chapter in Colombia’s historic Peace Accords. They have mobilized to protect their territories from international mining interests and extractive industries. From autonomous food systems to national and regional protests, they’ve steered the pedagogy and helped define the goals of their communities’ resistance efforts. Now, two years after that historic march, and within the context of Colombia’s formative, and hopefully post-war moment, Black Colombian women are convening their Black women comrades from all over Colombia, from Honduras, from Brazil, and from the U.S. for the National and International Gathering of Black Women Defenders of Life and Ancestral Territories. This gathering will strengthen Black women’s bonds of sisterhood by collectively constructing an agenda that articulates their efforts to face their many challenges, together from across the diaspora. The Black Women’s Mobilization for the Care of Life and the Ancestral Territories believes that just as Black Women gave birth to humanity, so too will Black Women give birth to humanity’s liberation. Through presentations, workshops, inter-generational exchanges, and cross-cultural dialogue, The National and International Gathering of Black Women Caregivers of Life and Ancestral Territories will create a collective agenda from, by and for Black Women for the collective care of life and ancestral territories with both local and afro-diasporic focus. Click here for more info about the gathering. Help make this work happen by donating whatever you’re able-any amount helps! We've made it 1/3 of the way to our $10,000 goal! The organizers of the Black Women's Gathering in Colombia wanted to send a message of thanks to all of you who've donated! Please share on facebook to spread the word and help us get to two thirds of our goal!